The humble printer is a piece of kit still very much at the heart of most business. Able to physically create printouts, posters, blueprints for design, promotional material and even a good old-fashioned letter; printers have a practical purpose when it comes to important papers, but also have the power transform creativity into a physicality. When it comes to choosing your printer, there’s a wide variety on the market. You’ll need to know whether your business requires a single-function or multi-use printer that works via inkjet or laser technology. Read on for a detailed account of the various costs associated with printer purchase and to dispel some of the myths surrounding the laser vs inkjet printer debate. Inkjet vs laser printers – which is right for your business? What’s the difference between inkjet and laser printing? What’s the difference between a single-function and multi-use printer? Acquisition costs: research, delivery and installation. Operational costs: maintenance, paper and ink/toner. The cost of a printer can vary greatly, and the price you can expect to pay will depend upon a variety of factors. These include the scale of your printing demands, whether you require A3 printing capacity, double or single-sided (duplex) printing, and extras like wireless printing, scanning, or even emailing. Inkjet vs laser – Which is right for me? For domestic purposes, or cases where fewer than 1,000 pages will be printed annually, an inkjet printer is the less expensive option (model and manufacturer dependent, of course). However, if your printing quantities are set to exceed 2,000 copies per year, then the laser option is more cost effective. An inkjet printer is less expensive to buy in the first place, but has greater upkeep costs. A laser printer is a more costly piece of kit, but tends to be easier to maintain. Toner is also less expensive than ink in terms of cost per page, especially in a business context, where print quantity exceeds 20,000 copies per year. Hewlett Packard are responsible for manufacturing over 50% of the printers sold in the UK, making HP printers the most popular choice. HP’s best-selling model, the HP Deskjet 3050A inkjet printer, retails for around £90. Cartridges for the 3050A cost in the region of £10-£15, and will last for 165 colour pages/190 monochrome pages. Comparatively, the best-selling laser printer manufactured by HP is the HP CP2025 colour LaserJet. With a retail price of £300 and toner cartridges coming in at £110, the initial costs of investing in a laser printer are very high. However, with a print yield of 2,800 colour pages/3,500 monochrome pages, once you’ve invested in a laser printer, the production costs are relatively minimal. Inkjet printers are initially less expensive than laser printers, but have higher long-term running costs. This is because the ink is costly, while the complexity of an inkjet mechanism makes it susceptible to breakages. If you’re looking for the most economical, long-term printing solution, then an A4 laser printer is the best option. Despite the hefty initial investment, their higher toner yield and a lower risk of malfunction make them the best option in terms of value for money. However, in terms of image quality, inkjet printers produce crisper and more refined lines at a higher resolution than a laser printer can achieve. So, if your business does a lot of photographic printing, design printouts, blueprint or graphic production, then an inkjet printer will best serve this purpose. Industrial printers are more specialised, and will suit businesses in need of label and packaging printing. Meanwhile, a wide-format printer is necessary for those looking to print the likes of banners, wallpaper and large-scale graphics. How much will I pay per page? According to Gartner, Inc., as much as 3% of a company’s revenue is spent on paper, printing, and other associated costs. With this statistic in mind, it’s important that your spending is going in the right direction; you need to invest in equipment that’s right for your business, making every printout matter. The prices in the above table are dependent upon the type of paper you choose to use. The industry term for paper type is ‘stock’, which is measured in gsm (grams per square metre) – the thicker the stock, the higher the cost. Coloured stock – is fun to print on, but can have disastrous effects on your image quality as the inks or toners will show up differently on coloured paper. Used for promotional materials or one-off print jobs. Coated stock – intended to improve the visual appearance of the print by making colours ‘pop’. A4 paper coats include silk, matte, and gloss, each giving a different, but distinctly ‘premium’ finish. Used for important mail correspondence and image-heavy printouts. Uncoated stock – gives a matte finish, and has become ‘en vogue’ recently as a fresh print revival emerges within pop culture. Great for internal documents, or for giving promotional material a retro, faded look as uncoated stock zaps harsh colours from your graphics. We would recommend purchasing your paper directly from your printer supplier, as they will be most familiar with the best paper for your model. This can have a significant impact upon your printer’s performance and the quality of your prints. Aside from the printer itself and the paper you’ll need to print onto, printers require ink or toner, too. Ink is, on the face of it, cheaper than toner, but then again, it requires more frequent replenishment. Toner, on the other hand, is pricey, but longer lasting. Top tip: according to the European Toner & Inkjet Remanufacturers Association, by buying refilled cartridges instead of brand new ones, you could make a significant saving of 30-50% on costly inks or toners. ❓What is an all-in-one printer? ❓Which businesses needs an all-in-one printer? 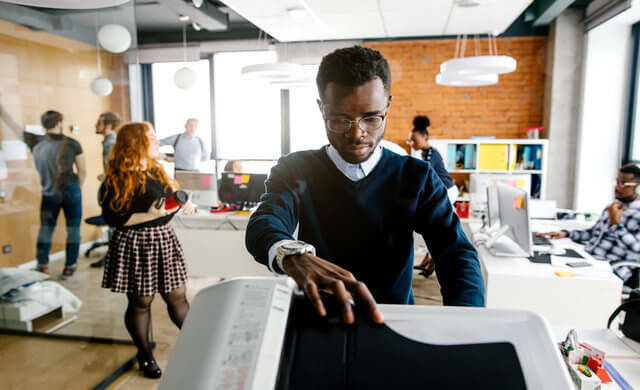 All in one printers are suitable for businesses that require a multitude of services from their printer, and print quite regularly in their day-to-day operations. ❓What’s the difference between laser and inkjet printers? On a very basic level, inkjet and laser printers differ in terms of what they use to pigment the paper: laser printers use toner, whilst inkjet printers use ink. As well as the pigment, the method of pigmentation differs between inkjet and laser printers. Inkjet printers work like a pen to paper: wet ink is applied to the paper via a fine, needle-like point. This takes time to dry, and can bleed on low-quality paper. Laser printers use toner, which is bonded to the paper via a process of photoelectronics, so the colour becomes fused with the paper. This means that toner does not require a drying time, and isn’t likely to smudge. However, as discussed above, laser printers are much more expensive to both buy and run. The number of pages per minute (ppm) it can produce. Do you need a high-volume capable printer, or can you make do with an average ppm? This will determine the number of pages you can print before needing to change the toner cartridge or replace the inks. This is defined by the resolution of the print. Measured in DPI (Dots Per Inch), the quality of print you need will depend on what you use your printouts for. Printouts for internal use only can be of a slightly lower quality compared to the prints you’d show to clients. This is the quantity a printer can print per month before becoming overburdened, risking damage to the system. The sturdier and more robust the printer, the higher the print-duty cycle. The above article has detailed some of the average costs you can expect to encounter when investing in a printer. Remember, the initial outlay is not the only expense you will incur – there’s replacement toners/inks, maintenance, and paper to consider. If you’re looking to buy a printer, but would like to speak to an expert, fill in the form at the top of the page and we’ll put you in touch with suppliers who will give you a same-day quote. Otherwise, if you need a printer but can’t quite afford the high upfront costs, why not consider leasing a printer instead of buying one? Leasing is considered a more affordable alternative to purchasing a printer – find out more in the Startups article on printer leasing.